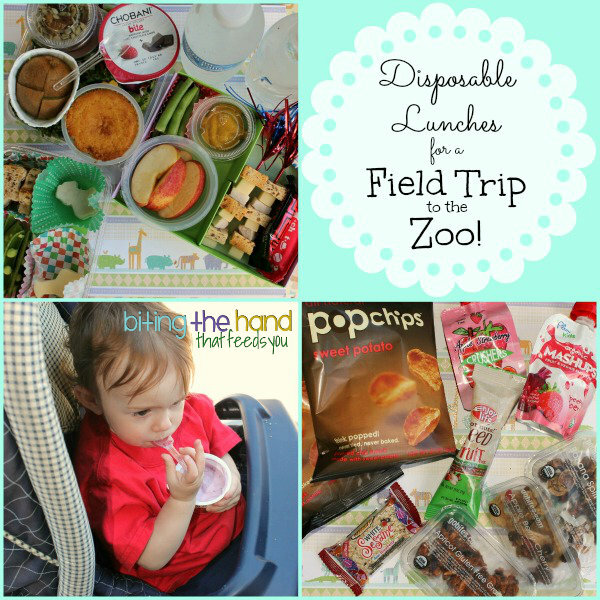 Biting The Hand That Feeds You: Thinking Outside the Box - Creative Disposable Field Trip Lunches! 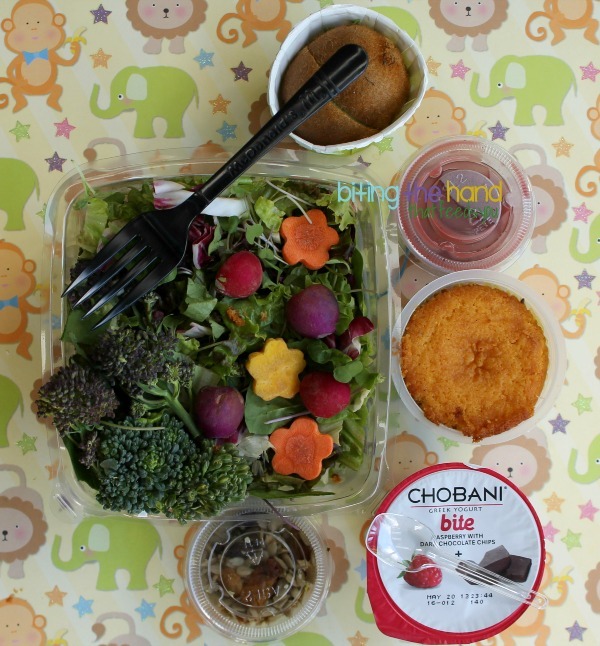 Thinking Outside the Box - Creative Disposable Field Trip Lunches! Thursday, 5/16/13 - Little Z's afternoon preschool has a field trip to the zoo every year in May, and it's the only event all year that siblings are allowed to attend, so even though it was on my birthday and I'd be wrangling them both on my own since Hubby couldn't get off work, Baby and I were GOING! While they ask for nut-free disposable lunches, realistically I could have used our bento boxes, since I'd be there to carry stuff home. But I've been eagerly saving stuff all year to re-use for this! In addition to our lunches (packed in a reused paper bag from somewhere) and frozen water bottles, I tossed in a few snacks as well, since it would be a loooong day, and we were allowed to stay later, since I wasn't driving anyone else back to school for pick-up. 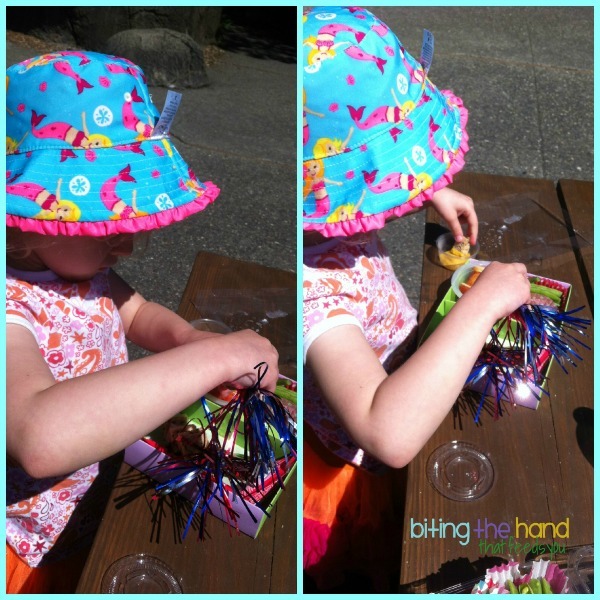 A few bags of Sweet Potato PopChips (had to include two, to avoid squabbling!) a few squeezy fruit pouches (disposable, since I didn't want to have to keep track of my re-usable ones,) and some nut-free snacks from various foodie subscription boxes. Mostly for Mama. Baby was a fan! She even ate a bread elephant! Since we went gluten-free, she's been hit-or-miss on whether or not she'll eat her bread on any given day. 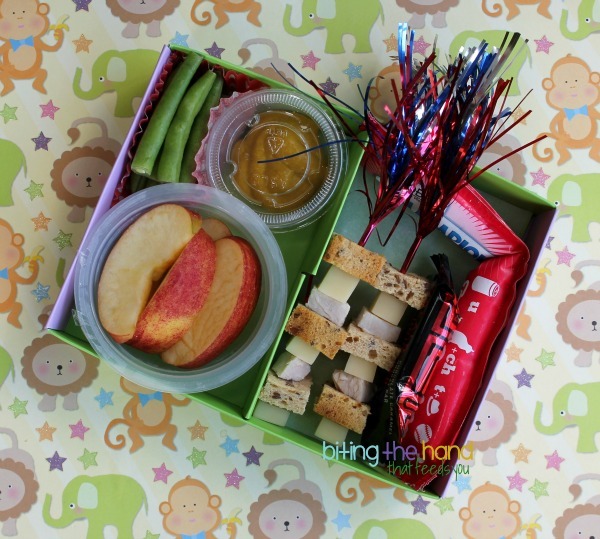 Since I had done a Lunchables Cracker Stacker-style zoo lunch for Z last year, I wanted to change it up a bit this year. 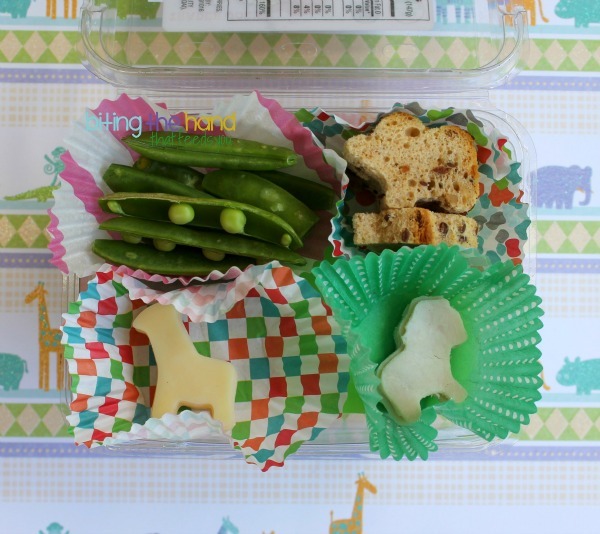 So I did the animals Lunchable for Baby, and did some fun deconstructed Sandwich Dippers for Z. Hubby had brought home some leftover chunks of turkey and assorted cheeses from a DIY Chef Salad thing at work one day (they get lunch catered,) so they were the perfect thing for these! I chose patriotic tinsel skewers mostly because they were the only ones I could find easily. Hooray for putting stuff away a year ago and not touching it since! 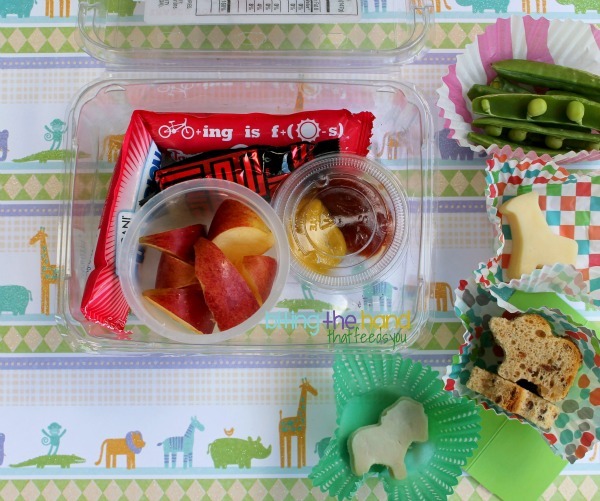 Mustard for dipping in a disposable dip cup, apples in a saved-and-washed applesauce cup, and cut green beans in a paper muffin cup. Instead of a plastic berry clamshell, I had saved the cardboard box (and plastic lid) that a set of cupcake liners and matching picks had come in. I had to remove one of the dividers, but was able to freeze the yogurt tube in place the night before, to make sure it would still fit in the morning! Had the zoo had separate bins for cardboard recycling or composting, this would have been perfect! You know those little individual packets of cut apples? I got some for my turn at snack for soccer (the, like, one game we did before she quit!) and they had come in these little cube-y containers. Hmmm... One of my big problems with the berry clamshells is that they have air holes, so are not good for salads. But with these, oh yes! I packed in as much of my salad mix as I could in the bottom half (plus a few artistic flowers using my flower veggie cutters,) and then stacked more food on the top to help fill me up. The muffin had been left over from our Mother's Day get-together at my sister's (and she made them gluten-free just for us!) It was tasty, so you know *I* hadn't baked it! Ha! I was able to stack the disposable sauce cups with my dressing and my dry mix-ins together, leaving room for my Chobani Bite yogurt and a paper snack cup with a cut-up kiwi. I also included a mini disposable spoon (I've been saving them from gelato places and washing them to re-use!) and a plastic fork from McD's that had come in their utensils packet, but I'd only needed the spoon or whatever, so I saved it. 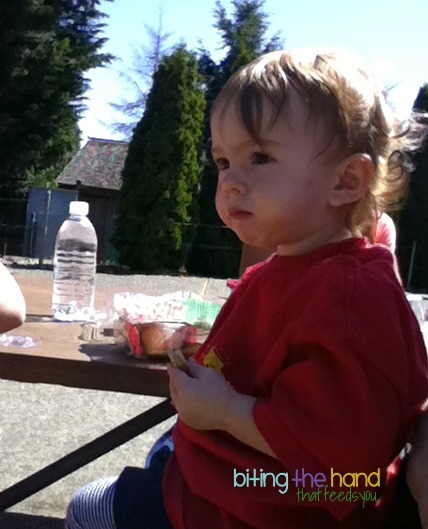 Well, MY lunch was certainly a big hit... the girls fought over MY cornbread muffin, and Baby ended up eating MY yogurt. Bah! I ended up dragging home our garbage and either composted it, recycled it, or washed and saved it again! 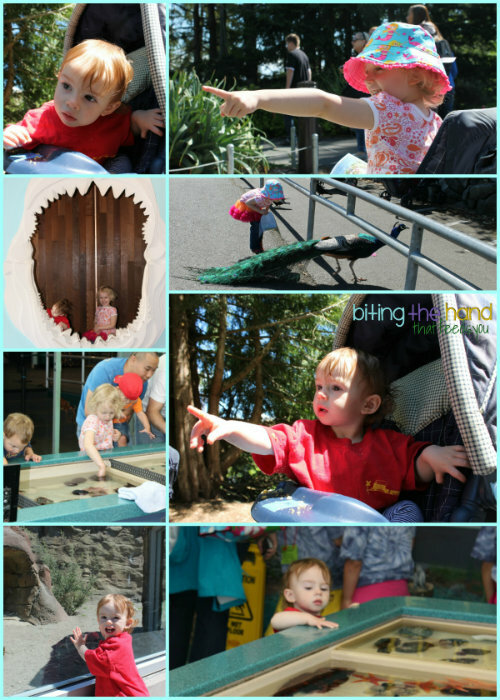 While this technically wasn't Baby's first trip to the zoo, she hadn't even been 5-months-old the first time she went, so it was the first time as far as SHE was concerned! Big Sis was supposed to wear her school's red T-shirt, so the kids could all identify each other and see who else was there from their school, but she refused. But Baby E insisted upon wearing it over her outfit, and looked adorable with her 6-month sized body in a 4-5 sized shirt! The girls had a blast! 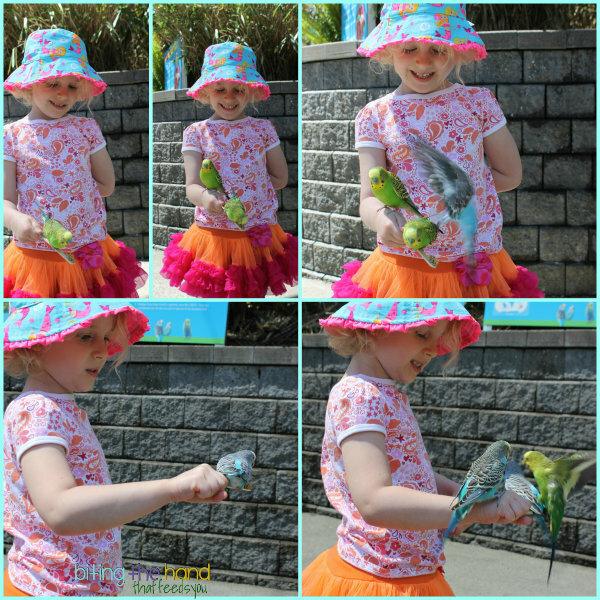 They both loved seeing all the animals, and even got to touch a few things in the aquarium area. But the hands-down favorite was the budgies! The zoo had a large netted enclosure where you could buy feed sticks (at $1 a pop!) and the birds would land on it to feed. Baby wanted to participate, but was scared when the birds actually came close. She first rubbed off the blobs of seed on the ends, and then when I trusted her with a third one, she ate it! So no more for her! Z was so into it though, and surprisingly brave, considering she has sensory issues and doesn't like to be touched. I had to keep buying more and more sticks! She really wanted a blue one to land on her, but those green ones were tenacious and pushy!